Bedfordshire is one of the smallest English counties but encompasses a great variety in landscape and architecture. 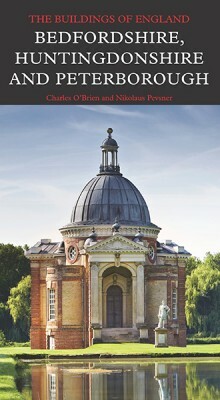 Its major monument is Woburn Abbey, one of the finest Georgian country houses in England, and the influence of the estate is widely felt in the model housing and schools in the county's villages. Its many other attractions range from the churches of the market towns of Bedford, Leighton Buzzard and Ampthill to the majestic gardens at Wrest Park. Such variety is also to be found in Huntingdonshire and Peterborough, famous not only for the Cathedral and the spires of the stone medieval parish churches scattered across its remote and intimate landscape but also for vast and stately Burghley House and Vanbrugh's Kimbolton Castle. This fully revised edition of Pevsner's original guide of 1968 contains separate introductions, gazetteers and photographs for Bedfordshire and Huntingdonshire and Peterborough.